Overall a decent movie - better than expected � Dubbing was distracting/poorly done, some overacting, number of plot holes �. Very well done. A refreshing take on science fiction story telling. It was nice to see that other countries other than the US is capable of saving the world. Thumbs up! All people, rather that a couple heroes, work together to save our home, the earth, and to save ourselves, the mankind. Great movie in any language! Love it! Will watch again. 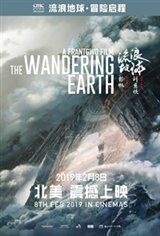 incredible science fiction movie, Go China, Go! Incredible! worth the five star.